Hey guys, a copy of our current WMS resides on each user’s terminal server desktop. I want to connect to a table (not linked) on the read side stored there. I tried > C:\Documents and Settings\%userprofile%\Desktop\MyDateBase.mdb< in the Login information with negative results. Is there a way to always connect to the user’s desktop copy? Environment variables are not supported for parameters directly in FlowHeater but you can use FlowHeater Parameters instead. There are two ways to overtake environment variables at definition start time. With .Net Script Heater and the simple Script below. You have to switch “Exceute when” to “Start” in the Heater options. The two solution above sets the FlowHeater Parameter $UP$ with the content of the environment variable %USERPROFILE% at start time. 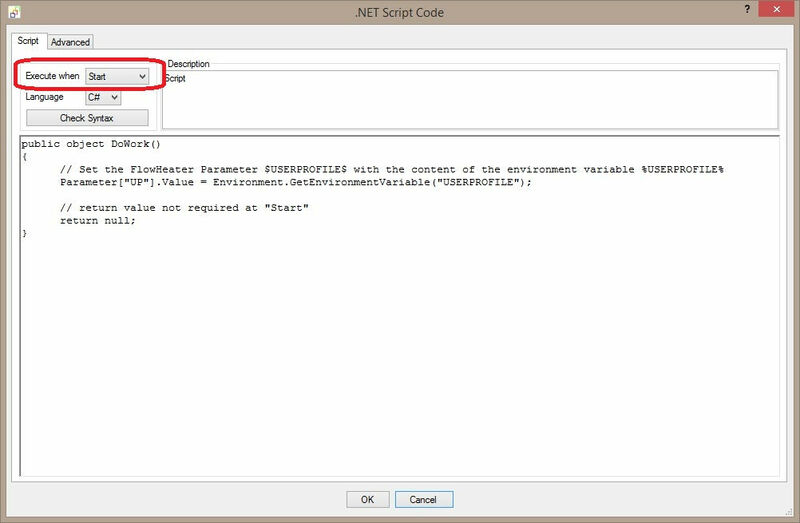 This parameter can be used in the filename for the Access Database . // return value not required at "Start"
That works great…as always, I can’t thank you enough. With our growing company this will be a great asset for us by allowing multiple users to run the end of day tasks simultaneously as opposed to one user.